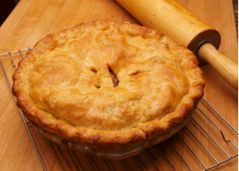 I’m sharing this basic apple pie recipe with you today. I have been making apple pies for over 40 years (yes, I am that old) and I never was taught to cook the apples first. Often, my pies would have hard apples inside or it would get too brown from over baking. This recipe will help both of those issues! At the end, I will provide some variations just by using this basic recipe and making a few minor changes! Enjoy! 1. Peel and core the apples, slice 1/4 inch thick. Toss with granulated sugar and lemon juice. Heat 4 tablespoons butter in a large skillet over medium-high heat. Add the apples and cook, stirring, until tender, about 10 minutes. Stir in the flour, cinnamon, and salt. cook until thickened, 1 more minute. Let cool. 2. Roll out 1 disk of dough into a 12-in round on a floured surface, est into a 9-inch pie plate. Add the apples, mounding them slightly in the center, and dot with the remaining 2 Tablespoons butter. Roll out the remaining dough into a 12-inch round. Lay it over the filling, press the edges of the crusts together, then fold the over-hang dough under itself and crimp to seal. Brush with the beaten egg and sprinkle with coarse sugar. Cut a few slits in the top crust. Chill 1 hour. 3. Place a baking sheet on the lowest oven rack and preheat to 425 degrees for 30 minutes. Place the pie on the hot baking sheet, lower the temperature to 375 degrees. Bake until golden, abut 1 hour to 1 hour, 10 minutes. (Cover the edges with foil if they brown too quickly). Cool on rack. 10 tablespoons cold unsalted butter, cut into pieces. Pulse the flour, baking powder, sugar and salt in a food processor. Add the shortening and one-third of the butter, pulse until the mixutre looks like coarse meal. Add the remaining butter and pulse until it is the size of peas. Add 1/4 cup ice water and pulse a few more times. If the dough doesn’t hold together when squeezed, add more ice water, 1 tablespoon at a time, pulsing. Divide between 2 sheets of plastic wrap. Pat into disks, and chill at least 1 hours. Variation 1: Apple-Berry Pie- Make apple pie from first recipe, adding 1 extra tablespoon flour and 1 teaspoon vanilla to the filling. Off the heat, stir in 1 cup mixed berries. Top with lattice crust, brush with a beaten egg and sprinkle with coarse sugar! Variation 2: Apple Strudel- Make apple pie with grated peeled Golden Delicious apples. Don’t cook the filling. Omit the 4 tablespoons of butter; toss the apples with the cinnamon, salt, 2 extra tablespoons flour and 1/2 cup raisins. Dot with 1 extra tablespoon butter. Variation 3: Apple Crumble – Make apple pie, adding 1 extra tablespoon flour to the filling. Off the heat, add 1/2 cup sour cream and 1/2 teaspoon nutmeg. Omit the top crust. Mix 1/2 cup flour, 1 cup oats, 3/4 cup each chopped walnuts and brown sugar, 6 tablespoons melted butter and a pinch of salt. Drop in clumps over the filling.